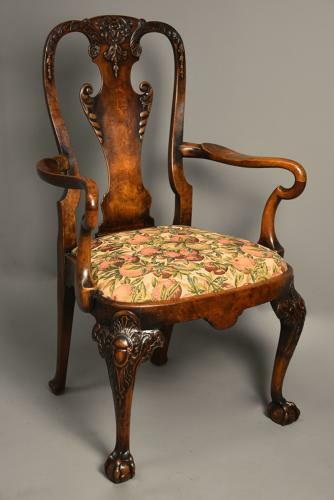 This finely executed armchair consists of a shaped back with floral, foliate and scroll carved decoration with central burr walnut veneered back splat with carved ears. This leads down to shepherd’s crook arms and a drop in upholstered seat finished in a fruit and foliate fabric (this can easily be changed to a fabric of choice once purchased) with a shaped front rail below. The armchair is supported by finely carved cabriole legs to the front leading down to a ball and claw foot, the back legs of outswept design terminating with a pad foot.